I had a vision in my head of adding a mesh insert to a skirt with a hemline like those 70’s athletic shorts that swoop up at the sides seams. What is that called anyways? The great thing about being addicted to pattern magazines is that if I can dream something up, I can flip through a pile of magazines and probably also find a pattern to work off of. This pattern from the May 2013 issues of Manequim did the trick. The swoopy part on the hem is marked on the pattern pieces, but from the magazine pic I’m thinking it was just supposed to mark a line to top-stitch. Since you have to add seam allowances it doesn’t really matter – I just separated the pieces and added seam allowances. I also added another stripe on the bottom to make in the main fabric. The main fabric is a black scuba knit I bought from Fabric Mart months ago when it must have been the weekly/daily special because the sticker said $3.99 a yard. I must have bought about 6 yards but I don’t regret it a bit – this is some great fabric and very versatile. After I cut the pieces out I sewed the mesh insets in first. 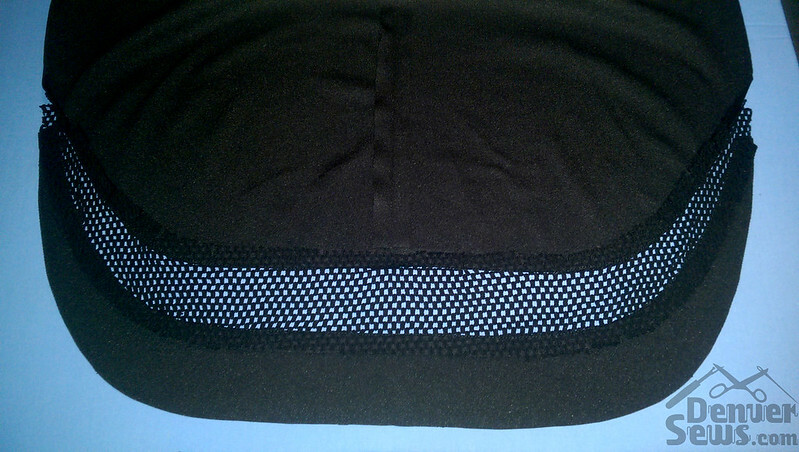 The seam allowances needed to be pressed towards the scuba knit so they didn’t show behind the mesh. Next I sewed the the front and back together, added the waistband, and then added top-stitching to hold the seam allowances to the side I pressed them to. I added lines of top-stitching to the waistband like in the magazine photo to give it an athletic look. (I left the drawstring out though.) Also, pockets! Here’s a closeup of the details. All of the stitching was done with a stretch stitch on my regular sewing machine. It went together surprisingly fast, and I think I spent more time on the top-stitching than the rest of it put together. I’ve already worn the skirt twice – it’s comfortable and I like the juxtaposition of dressy and athletic elements. By the way, are you curious about what the heck Manequim magazine is? It’s a pattern magazine from Brazil which I LOVE. Unfortunately it’s all in Portuguese and the patterns generally only come in one size so you either have to only sew what’s in your size or do a bit of grading. Plus size models that actually look plus size! Another reason I enjoy Manequim. Previous Operation: Core Wardrobe – What shape am I? I am working with a manequim pattern sheet. One of my foreign exchange students gave the magazine to me after a class discussion on pattern sheets. Do you know if there are seam allowances on the patterns or do I need to add them? I have made a cute top, but started having fit issues with the collar. The collar stand seems way too small, so I am guessing there are no seam allowances. Thanks for you help. Jamie, your skirt is really pretty. The Manequim.com magazine looks nice,but is it in english? Nope, it is NOT in English – they speak Portuguese in Brazil. I haven’t tried anything complicated from this magazine yet, but usually I can just figure out how the pieces go together. I guess don’t try it if you need instructions! FYI, it’s kind of like Burda in that there are only a few plus size patterns per issue, so I’m not sure you’d be any happier with it. I saw plus size special issues on their website but I can’t figure out how to order them. Totally understand the squirrelly sewing plan. It’s strange they only offer one size which leads me to believe that Brazil has some really knowledgeable home sewers. Grading up or down one size is easy but multiple sizes is tricky. You look great in things other than skinny jeans! Brazilian sewers must have mad skills. This isn’t even the only Brazilian sewing magazine – I’ve seen at least 3 other ones on eBay and have a couple copies. Sewing must be really popular there? I’m jealous. Cute skirt. Also, I’d love to borrow Mannequin to trace the jacket #274. Great lines. And I agree, I think I prefer it to Burda too. That jacket has FANTASTIC lines. I was looking at it longingly and thinking there was no way I could grade that many pieces up from a size 40, so it would be awesome if you made it. Wow, Jamie, I absolutely love that skirt! You are so clever in your ability to incorporate current trends into your garments. And the sewing is so good it looks like expensive RTW. Excellent job!!! I love the styles in Manequim too! You’re too nice. I forgot to mention I used a new 1/4″ quilting foot for all the top-stitching; made it soooo easy!